A quick homemade Caesar dressing tops these crunchy, refreshing wraps. Don't be scared off by the anchovy paste—it adds a punch of umami that the creamy dressing needs, and the paste is a great condiment to have around. Try a teaspoon in other salad dressings, in pasta sauce or even mixed in with softened butter for a savory burst of flavor. These salad wraps are great for a portable, make-ahead lunch: you can prepare the dressing, shred the chicken and chop the romaine ahead of time, then assemble the wraps in the morning before leaving for work. The dressing can be made in advance, and will keep in the refrigerator for up to a week. For a slightly healthier dressing, substitute 1/2 cup Greek yogurt for the same measurement of mayonnaise. The dressing will taste a little tangier, but will still be creamy. Per Serving: 602 calories; 42g fat; 31.4g carbohydrates; 23g protein; 84mg cholesterol; 737mg sodium. 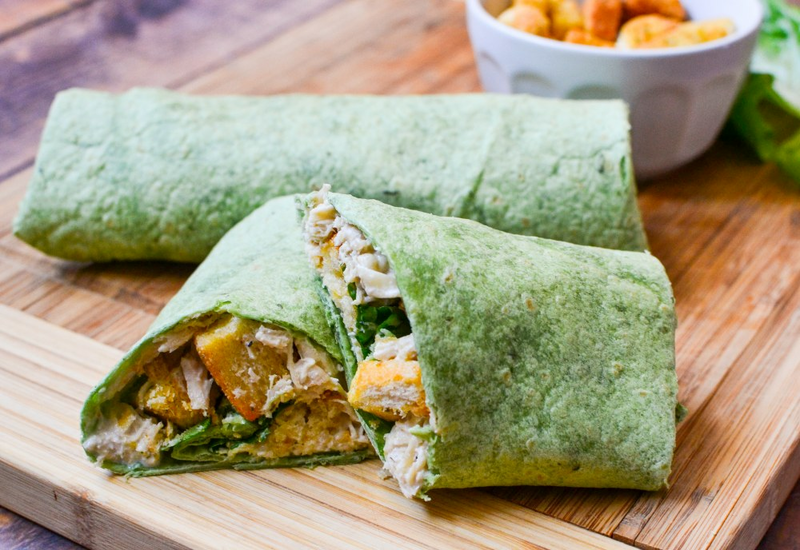 These chicken Caesar wraps are simple and good. I like to take them for work and eat them cold. I love using either the spinach or tomato tortillas. Delicious! Really delicious chicken Caesar wrap recipe. For the chicken I used shredded rotisserie and it was great. I ate about 2 or 3 in one sitting, because I'm extra greedy and they tasted amazing. Perfect for lunch or dinner! If you like chicken Caesar salads you will really enjoy this recipe. I would have liked to get a recipe for the shredded chicken. That's the only reason I gave it 4 stars instead of 5. I used left over chicken, but added some seasonings too it. I really liked the chicken Caesar wraps, made them without croutons and used store-bought dressing to make it easier. Used 1/2 cup Greek yogurt for the dressing and love the tangy flavor. I always try to swap in yogurt when I can. Also, I used tomato tortillas for the wraps. They're hard to find but are so good.